The Pekingese is a well-balanced, compact dog of Chinese origin with a heavy front and lighter hindquarters. They are small dogs but are not to be considered delicate or dainty. Their image is lion-like, implying courage, dignity, boldness and self-esteem. They can be any color. Chinese art throughout the ages, starting with the Tang dynasty of the 8th century, abounds with images of the Pekingese, who gets his name from the ancient city of Peking, now called Beijing. Pekingese were held sacred in ancient China and could only be owned by royalty. At that time, the punishment for stealing a Pekingese was death. Pekingese came to Europe as a result of war. When the British overtook the Chinese Imperial Palace in 1860, they returned home with several of the dogs. 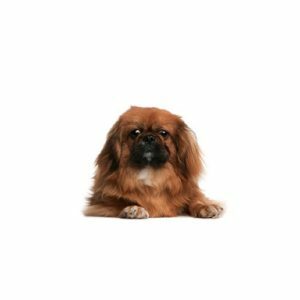 Pekingese possess a regal dignity, intelligence and self-importance, making them good natured, opinionated and affectionate family companions. Their small size makes them a good choice for apartment life, but they are sometimes difficult to housebreak. They are relatively inactive indoors and do not need a yard, but enjoy walks. Because of their long undercoats, Pekes need at least an hourly brushing session per week. Toy Group; AKC recognized in 1906. Weigh less than 14 pounds. Are you interested in purchasing a Pekingese?